Finally! 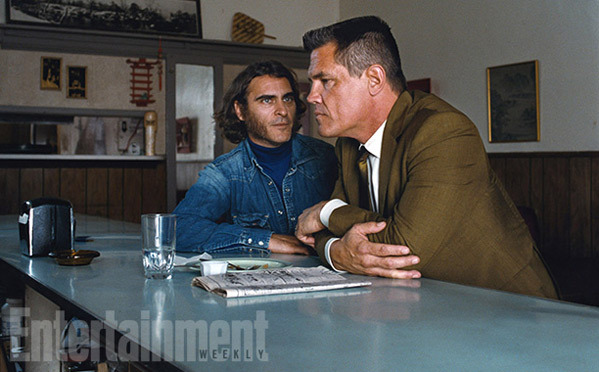 Meet Doc Sportello - Joaquin Phoenix in Paul Thomas Anderson's new film Inherent Vice. Set in the 1970s, Doc is a marijuana-loving private eye and investigates the disappearance of a former girlfriend in this "Cheech and Chong"-esque film from PTA - in theaters this winter. While we've featured one set photo previously, we've also been waiting patiently for an actual first look that isn't a set photo, and we finally have this: a shot from Entertainment Weekly, but it's something, as we get to see that impressive hairdo on Joaquin. I'm anxiously awaiting this mostly because it's PTA but it also sounds like so much fun. Described as "a Cheech and Chong movie", Inherent Vice is an adaptation of Thomas Pynchon's novel about stoner private eye Doc Sportello in a 1970's "part noir, part psychedelic romp" detective story. In Los Angeles in 1970, drug-fueled detective Doc Sportello investigates the disappearance of a former girlfriend. It sounds like something totally different from PTA, almost closer to his roots of Boogie Nights than The Master or There Will Be Blood, but it should be fun anyway. Warner Bros will release PTA's Inherent Vice in theaters starting December 12th, 2014 this year, before going wide in January. Stay tuned for the trailer. Joaquin Phoenix looks like he's trying out to be the next Wolverine in that costume, got the long hair, bushy sideburns, and of course the denim jacket. Yea Hugh Jackman better watch out lol. Joaquin looks like he's doin a bit more than weed. Maybe live action BEAVIS AND BUTTHEAD characters (obviously not the title characters though). I'm so ready for the trailer. Phoenix's mutton chops are epic! I really hope they were real! Joaquin looks like John Byrne's Wolverine! This looks too good to be true. Can't wait! PTA returns to the 70s? Yes, please.